A private or public sleeping space? ”Sleeping with Stallman is a ‘hack’ into the exhibition space with the simple activity of sleep or rest. The temporary micro-space is part of the “Disobedience Archive” research and exhibition curated by Marco Scotini together with Nomeda & Gediminas Urbonas on show until April 15th in the MIT Media Lab lobby. It consists of a soft platform that hosts three sound compilations and three reading sections. The project is very popular among MIT community since in this case art provides a function, an opportunity for the users to occupy the building in a more comfortable way through naps and rests. It creates a contrasting to the transparent (surveilling, open) Media Lab, little corner where one can hide and sleep without complete isolation. It provides an opportunity to enjoy the small (individual bubble) while being part of the big (system). *ZIG-ZAG is a series of two-fold posts that present one project (ZIG) and their creator (ZAG). 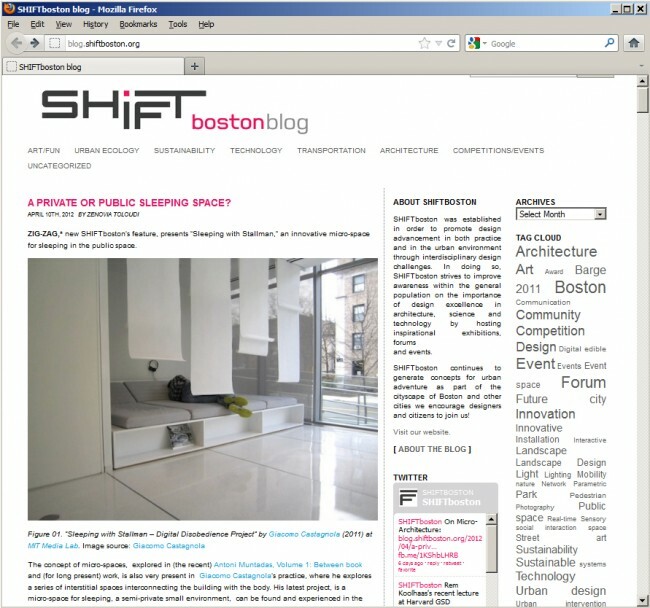 SHIFTboston’s readers can participate in the process by submitting their questions and comments (ZAG), or to pinpoint interesting projects or their projects for exploration (ZIG).